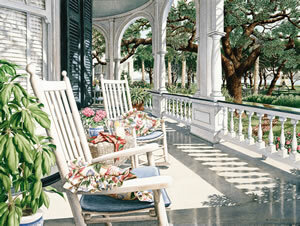 Dempsey’s five paintings of Charleston scenes reflect not only the beauty but Dempsey’s love of the Old South. As you immerse yourself in the Charleston paintings you become aware of the clip clop of the horse drawn carriages and the smell of salt air along the battery. 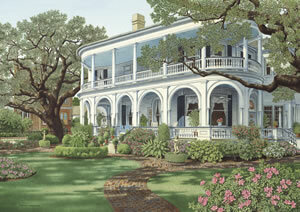 Charleston speaks of flowers, salt ocean breezes, and southern hospitalilty. If you are an artist, no matter where you go, you always see your surroundings in terms of what would look good in a painting. You fall into the habit of looking at everything in terms of light and shadow; color and shape; setting and beauty. You always have a camera with a high resolution lens to record scenes that you may want to study later. Then, when the right bells go off you might revisit the site several times at different times of day to watch the shifting patterns of light and shadow. Always you are waiting for that little light to go on in your head that says "This is IT." 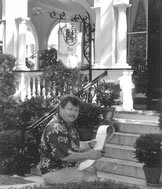 Dempsey Essick was spending a few days in one of his favorite cities, Charleston, SC, where early one morning on a casual exercise stroll, he turned a corner just as the early morning sun slanted in from the ocean and spotlighted the arresting scene of a bay window (at 5 Atlantic Street) which seemed to rise out of a tier of flowers. Flanked on either side by beautiful brickwork, wrought iron railings and a gate leading to a side yard with a large crape myrtle tree, the texture of the scene was enhanced by a wide, flagstone walkway. The scene was almost made to order for an Essick painting combining, as it does, striking beauty, the texture of brick and flagstone with a lovely wrought iron gate and an abundance of hydrangeas and impatiens to attract the long bill of any passing humming bird. So, Dempsey got out his palette and his watercolors and went to work. Slowly, stroke by stroke, hour by hour, he carefully recreated the scene for the pleasure of everyone who sees "Charleston Stroll." Everything is here for the Essick connoisseur from the carefully created individual leaves to the varied shades of gray in the broken and uneven flagstones, to the texture of the bricks and the wrought iron gate. The low angle of the early morning sun creates long shadows that delineate each board in the houses, make mirrors of the windows, and emphasize the trees and lower foliage. If Dempsey has an identifying mark it is a hummingbird and he couldn't resist the opportunity to include one here, busily sipping nectar from one of the flowers. For those who love locating the rebus hummingbird he traditionally includes in all his paintings, that one is here too but you have to find it. Print owners will delight in the fact that Dempsey, at no charge, will retouch the mortar of the slate sidewalk by adding a name, initials, or a special date. Occasionally an artist will find a subject so compelling that he simply must return, perhaps more than once, to display all its facets. For Dempsey Essick, the Carrington-Carr House at Two Meeting Street in Charleston, South Carolina, is such a subject. 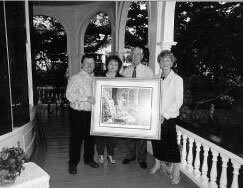 After doing three paintings at the location ("View from the Veranda", "Morning Coffee", and "Afternoon Tea") from a point of view looking outward from the arched veranda, Dempsey has figuratively stepped off of the veranda and walked out to the street for a look back a the magnificent building. The task Dempsey had set for himself in undertaking the Two Meeting Street painting was daunting. With a reputation as one of the South¹s leading realist painters, Dempsey could not skimp or gloss over any aspect of the scene. 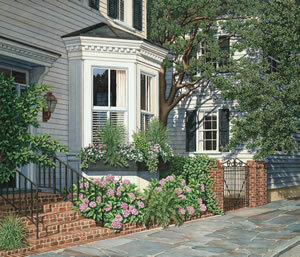 Each brick, board, bush, blossom, and balustrade had to be depicted honestly and in scale with the overall scene. More importantly, the character of the house had to be the dominant and ruling factor of the finished picture. There was no way he could do the painting from a distance using photographs and sketches. It was imperative that he be on the scene as each aspect of the finished painting developed. For this reason he rented a small apartment where he could get the solitude he required and where he could go daily to sketch and refresh his memory. He worked twelve and fourteen-hour days and Shelley noticed in their nightly phone call that we was sounding groggy. So she called a meeting of their Movie Club who agreed to meet Dempsey at Myrtle Beach for a weekend of rest and relaxation. At the last minute Dempsey decided that it wouldn’t be safe to leave the partially completed painting in the apartment so he taped it between two large pieces of corrugated cardboard (the non-traditional way to transport a valued original painting) and he took it with him. The group had great fun and Dempsey had a mental break. By 10:00 a.m. Sunday morning, they had checked out and loaded their cars but then decided not to leave until noon so that the Lexington bunch would miss the race traffic. At 11:50 they were sitting in the lobby of the hotel playing cards when they noticed one of the maids dragging a large piece of cardboard en route to the dumpster that stood open and waiting. Shelley hollered and Dempsey bolted. THE PAINTING HAD BEEN LEFT IN THE ROOM! Ten minutes more and all would have been lost. Dempsey said, "I'm usually pretty laid back, but this time I saw my life flash before my eyes." Well anyway, they saved the painting. Dempsey went back to the apartment and, after several more weeks (an estimated 832 working hours), he had finished the masterpiece titled "Two Meeting Street" though there was some consideration for calling it "The Cardboard Caper". There is no record of how painters in the past transported their work. In Rembrandt's time there was no corrugated cardboard. Likewise Van Gogh did cut off his ear. Do you suppose he lost a painting and whacked off the ear in a fit of despair? Anyhow, all's well etc. Shelley said it was the fastest she'd seen Dempsey move since they were in high school. And Dempsey still has both ears. Viewers will be astounded at the fine detail, the control of color, and the balance of the finished painting. "Two Meeting Street" is, by any measure, the pinnacle of Dempsey Essick’s career to date. Founded in 1670, the city of Charleston, South Carolina is pervaded with the ageless charm of the eighteenth and nineteenth centuries. Old churches, beautiful gardens, and stately homes set on streets designed for horse and buggy traffic recall the beauty and serenity of the antebellum south. Dempsey Essick sometimes vacations at the Two Meeting Street Inn, in Charleston. Historically known as the Carrington-Carr House, the inn is situated on a double lot on the corner of Meeting and South Battery. 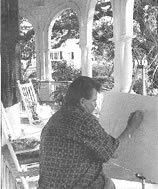 Dempsey likes to relax on the wide veranda with its double columned arches which curve around one end of the hundred-year-old home in a manner reminiscent of an early river boat. 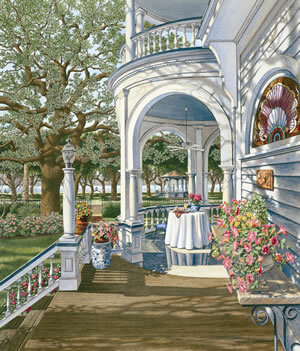 In his "View from the Veranda", Dempsey has captured the essence of Charleston's fresh salt air, flower garden, and quiet tree lined streets. 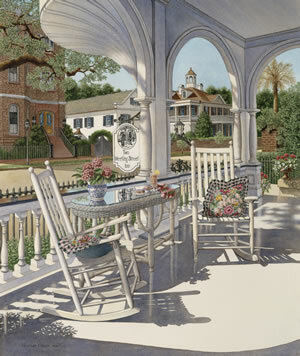 Approaching the painting, the viewer's eye drifts past the big-leaf schefflera in the left foreground and settles on two invitingly comfortable porch rockers with flowered cushions and a wicker table set with a pitcher of lemonade. In the background, framed by freshly painted arches, a sprawling old live oak's tangled and twisted limbs stand in contrast to the stately trunks of a row of palm trees which define the boundary of the White Point Gardens. The gardens mark the tip of the Charleston peninsula where the Ashley and the Cooper Rivers merge to form Charleston Harbor which can be seen just past the Battery walk in the distance. The mark of an Essick painting is in the small details. After the overall impact of the picture, the viewer begins to notice such things as the texture of the cushions; shadow patterns across the floor and onto the wall and shutters; even a glimpse of brick walkway through the banisters. And, in the distant trees, tendrils of Spanish moss indelibly stamp the scene as being in the deep South.